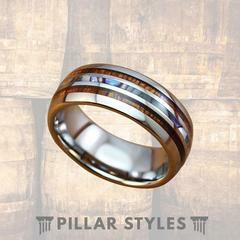 You may notice some custom orders for wedding bands reading the reviews. 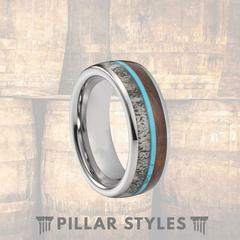 If you have something in mind or see a ring you would like with a different inlay or color - let us know! 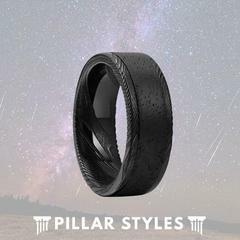 We'd love to work with you in creating a unique wedding band. 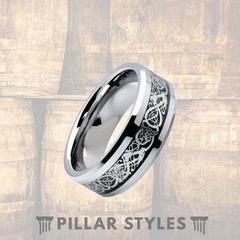 Also, tap or click on any image of the rings listed in the reviews to get more information on style and sizing! The seller answers questions fast and is willing to help you with whatever your needs are. 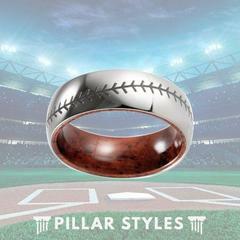 For example the size was a little too small for the ring that was purchased. They were fast to answer the message and quick to help find a solution. 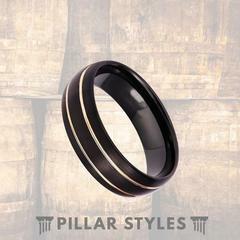 I really recommend them if you are looking for a great ring and wonderful service." 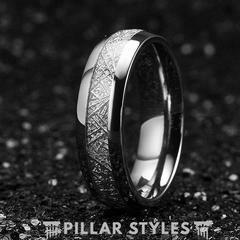 The ring was the most beautiful mens ring I have looked at. I tried many mall stores and everything was so bland. My daughter suggested Etsy. I'm so happy I found this one. The ring is absolutely amazing! My fiance loves it. Can't wait to get married so he can wear it all the time! Thank you so much! Received my fiancé’s ring in the mail today. Him and myself were both impressed by how beautiful it is. 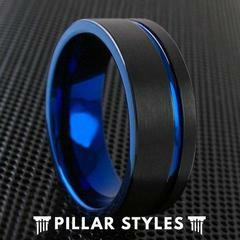 Feels like a really durable ring. Ava is sweet and professional. She is someone I would recommend all around! I was surprised when I opened the package to see a thank you note inside. That was also worth noting in my opinion. Great Etsy shop, great product! Thank you a thousand times over! ☺️👍🏻"
I was pleasantly surprised when I messaged them with a couple of questions and they responded back to me within the hour. That was the deciding factor of where to purchase my fiance's ring.They shipped promptly with me being able to track. It came on the day expected in a sealed and secure material. I was very pleased with the quality and I think it will look even better once he is wearing it. Possibly the best customer support from this lovely shop owner. We ordered our ring, but my fiancé was a bit off on his size. She graciously let us exchange it for a size up. The whole process to exchange was easy and very fair given the cost to ship! My fiancé can’t wait to wear his ring! Thank you! The ring arrived quickly and is beautiful-even prettier than the picture. I can't wait to present it to my fiancé. Ava was lovely to interact with. Thank you! 5 stars all around. Ava kept in touch with me to assure me it was being made! Luckily I didn't have a deadline and was able to wait for this gorgeous creation. The hubby has been showing it off to everyone and we couldn't be happier! My husband and I decided to get hitched with maybe 2 weeks notice. I loved this ring but contacted Ava to see if she thought it would get to us (Edmonton, Alberta) in time. She thought maybe it would ! She said she’d start it right away. I think I got a notification that it was shipped THAT SAME DAY! And it arrived no less than one day before our wedding day. My husband absolutely loves it and he gets many compliments on it. Thank you thank you thank Ava for the beautiful ring and making our special day !! 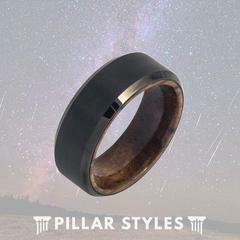 My husband absolutely loved this unique piece for his wedding band! It reminds him of his time living in Hawaii. It shipped on time and Ava even sent a personalized message after the shipment saying she hoped we enjoyed the product. Definitely recommend buying here! 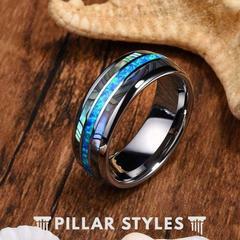 My husband absolutely loved this ring! 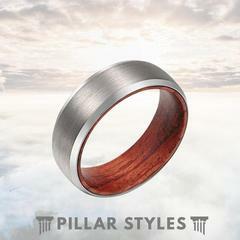 It was purchased as an anniversary gift after he lost his wedding ring! 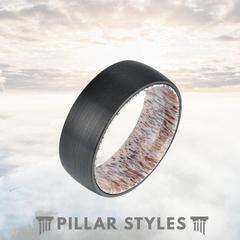 I fell in love with the design as it contained Koa wood and our honeymoon was in Maui! It fit our story perfectly and the design is totally him! Thank you so much Ava for an amazing and beautiful piece!! Very good quality and fast shipping!! She certainly did not disappoint here!! Love love love! I can't say enough about my new ring and this wonderful shop. First, communication was amazing from start to finish. Ava was so incredibly helpful at every step of the process. My ring was made quickly but with so much care and precision. It is stunning... Unique, feminine, and beautiful. I couldn't be happier and I can't wait to place my next order. This wedding band is more than we could have asked for! 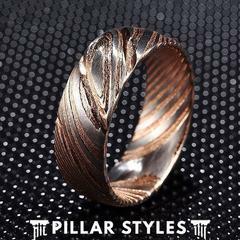 My soon to be husband absolutely loves this ring. It is great quality and is unique. 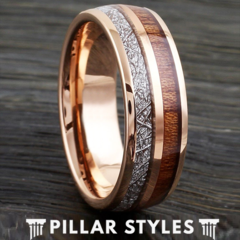 The wood inlay with the Damascus steel is both masculine and beautiful! Could not be happier! The ring is absolutely beautiful! The quality feels really nice and it has a good weight to it. 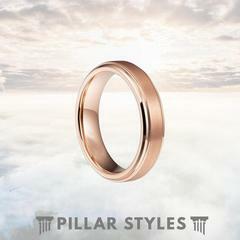 One thing to note: the bands of rose gold are slightly indented, meaning the surface of the ring isn't smooth and continuous. I actually really like that about it, but it was unexpected, so just in case anyone was wondering! The ring is perfect. Quality is amazing! 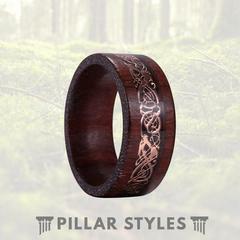 My husband to be was really looking for something unique and this ring is perfect! Also, fast shipping, and excellent communication with the seller! Although it’s a little too big for my soon to be hubby, we both are very satisfied with the quality! The shipping time was super fast and the customer service was top notch! This ring is so perfect. Its lightweight and my finace says it is very comfortable. 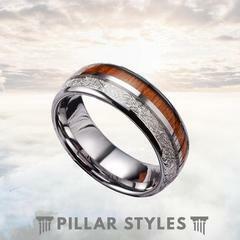 The wood work and metal inlay and gorgeous and I'm sure this ring will be treasured for all of our lives. It's perfect!! The shop owner even sent a handwritten thank you note which I thought made the experience more personal!! I am so excited to give my husband this beautiful ring for his birthday. The ordering process, help with sizing and shipping exceeded my expectations. Thank you so much. Gorgeous ring! Had to return for a smaller size for my fiancé, but we both love it. Ava has been very great and accommodating with the return and very responsive. 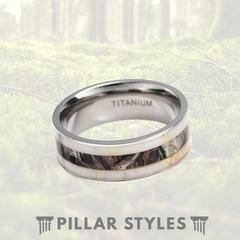 Thinking of another one as his wedding band.